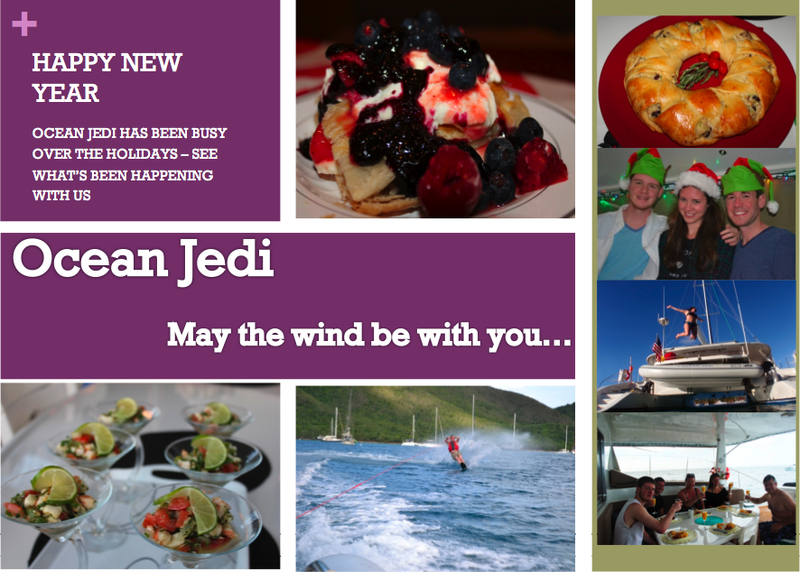 We just received wonderful comments back from charterers we had aboard the catamaran VIP ONE for a Christmas family sailing vacation in the Virgin Islands (mom, dad, and 4 kids aged 23, 21, 19, 13). 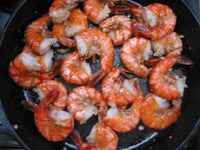 Our clients own an award-winning seafood restaurant in South Carolina, so to say that "the chef did an amazing job" has quite a bit of clout. UPDATE: MAY 28, 2014 - David wrote to tell us that they were no longer crew on VIP One and wanted us to update this blog post. Also, VIP One is no longer chartering within the Caribbean Antilles. We are missing them already so thank you again for your charter and hope to hear from you soon. Sorry for taking so long to get back to you guys about our amazing trip (life in the "real" world got in the way). We can't rave enough to everyone that asks about our trip. David & Rita.... what an amazing couple, they totally made the trip! Fun, young, entertaining, intelligent well just fantastic! David (and Rita) was so very thoughtful to ALL of us, and Rita was totally up for the challenge of cooking for a family with some demanding requests (vegetarian, Type1 diabetic, and VERY hungry young men), she did an amazing job. The sailboat was kept in immaculate condition and David truly takes care of it like his own, and it's in tip-top condition. Every evening we had something different going on, one evening very though-provoking exchange of ideas and one evening we just played games... or out on one of the islands. We can't say enough good things about David and Rita, truly gems!!! We recommend them HIGHLY to anyone: families with kids, adults only and everything in-between! We wanted to take them home with us! We love happy crew and guests! 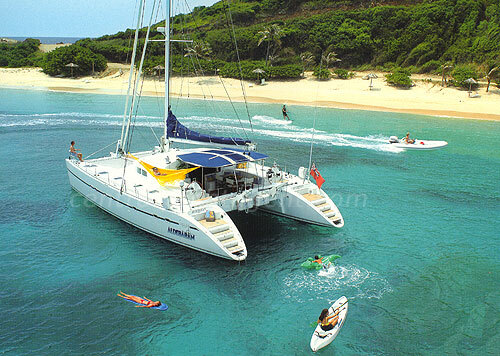 VIP One is a 2011, 50-foot Lagoon 500 catamaran with a crew of two. Though based in St Martin, they charter throughout the Caribbean. VIP One has a flybridge, is fully air conditioned and accommodates up to 8 guests in 4 cabins (Queens) with private ensuite head/shower. Amenities include: waterskis, tube, wakeboard, 2 kayaks, snorkle equipment, 2 kite surfers, Satellite TV/DVD in salon, onboard wifi, etc. Charter Yacht Sea Witch : Need a break? Sea Witch is a 58-foot Pearson sloop owned and operated by John and Susan Stephenson, plus their cat Tulang. Tulang is a 15-year old Singapora, with short hair and very low dander. Susan says that guests love Tulang and want to take him home at the end of their charter. Sea Witch is fully air conditioned and accommodates up to 4 guests in your choice of 2 of the 3 cabins. The master cabin aft is full-width and has a queen-sized bed on the centerline, and ensuite head/shower. The forward cabin has a large queen-sized V-berth (tapers towards bow) and the mid-ship cabin has upper & lower single bunks. The two forward cabins share a head/shower. See our online brochure for more information. Superb boat & crew! Don't you deserve a break? Sea Witch will be departing the Virgin Islands mid-May and heading North! 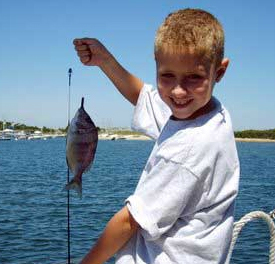 They will be available for New England charters beginning in June and throughout the summer into October. Then it will be time for them to begin their journey back to the Caribbean. The charter yacht OCEAN JEDI, a 58-foot Cata Ballotta catamaran, sends everyone their best wishes for the new year. 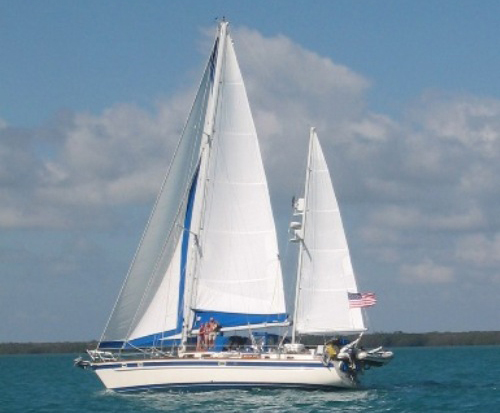 Ocean Jedi is a 58-foot Cata Ballotta catamaran with an owner-operator crew of two, Frank & Denise. The yacht has a flybridge, is fully air conditioned, and accommodates up to 6 guests in 3 cabins, each with King-size berth, flatscreen TV/DVD and private, ensuite head/shower. Ocean Jedi has a 14-foot dinghy with 40HP motor, tube, 2 kayaks, 2 stand-up paddle boards (SUP), 2 underwater scooters, floating chairs, noodles, snorkel gear, fishing equipment, TV/DVD, hammock, wifi where available, etc. 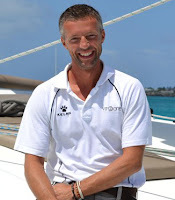 Frank is a dive instructor and offers diving to certified divers at $40/dive/diver. Bring your own gear or rent. Please note that Ocean Jedi is a NON-SMOKING yacht. If you'd like to train to become an Ocean Jedi, contact us! 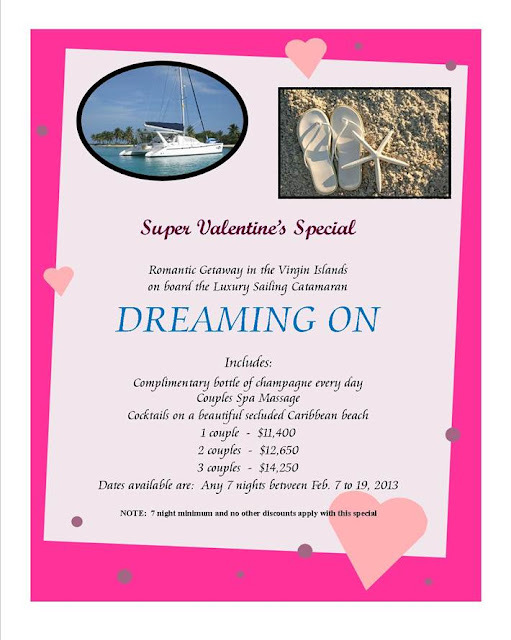 The charter yacht DREAMING ON, a 47-foot Leopard catamaran, has a Valentine's special for any 7-night charter occurring between February 7-19, 2013. Dreaming On is equipped with plenty of water toys to keep everyone entertained. Toys include: 13-foot center console dinghy with 30hp outboard, waterskis, kneeboard, stand up paddle board, windsurfer, tube, wake board, two one-person kayaks, floating mats, beach games, fishing gear, double hammock and even a floating island! Looking forward to your inquires! The other day we blogged that the charter yacht Aldebaran, a 57-foot Lagoon catamaran, has a new crew this season, Oliver & Naomi. To sum up our thoughts in one word we would simply say AMAZING. The trip exceeded our expectations and we had the best time. We were able to relax peacefully, yet explore and eat some amazing foods! Nay was a fabulous cook and there wasn't a single meal we didn't love. Breakfast was perfect, we would have simple breakfasts some mornings with bagels or croissants, or more elaborate breakfasts such as bacon or salmon and eggs. Can't forget the wonderful fresh fruit bowls she served us almost daily! Lunches were yet another amazing feast. We had pasta for lunch quite a few times, but were fabulous every time. I think the pasta with shrimp was our favorite. Although the mussels were amazing too! We would often have an afternoon "nibble" made up of cheese trays, hummus, or other little snacks. 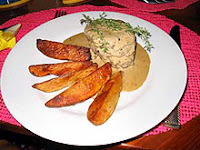 Dinners were better than we imagined as well. We had filets, tuna, mahi mahi, and much more. Just as we thought we couldn't eat more, Nay would bring out one of her scrumptious desserts. She cooked some amazing desserts such as a lemon tart and carrot cake for Macie's birthday. I should also mention the cocktails Oli would mix up for us, he was always trying something a little different and new and never failed us! 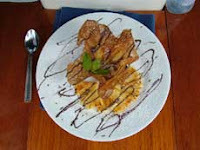 Although it seems like all we did was eat, we also had a wonderful time exploring the BVIs. We visited Jost Van Dyke, Anegada, Virgin Gorda, Tortola, Cooper Island, Salt Island, Peter Island, Indians, and Norman Island. On Jost Van Dyke we all enjoyed the Bubbly Pools. The Baths in Virgin Gorda were breathtaking. Along our travels we saw dolphins and sea turtles. On New Year's Eve we all ventured in to Tortola and took on some island night life. There were performers on stilts and fire burning sculptures in the waters. We all enjoyed snorkeling and saw some amazing sea life. We were able to snorkel on an old ship wreck and around some beautiful reefs. 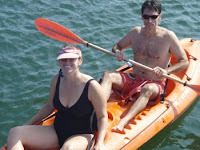 We also tubed behind the dinghy and kayaked to shore a couple of times! Much like everything else the boat itself also exceeded our expectations. We all enjoyed the front part of the boat and laying out on what we called the "trampoline". Oli would hang the hammock or a tent for us to get some shade, which was a nice break from the sun. The rooms were plenty enough for us, as you don't spend much time in them anyways. Eating out on the deck area was a pleasure and the views were always amazing. And last but certainly not least, Oli and Nay. They were GREAT! We had so much fun with them. They did a wonderful job making us feel at home and taking care of whatever we could possibly need. 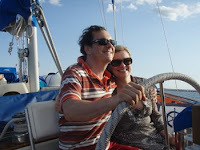 Oli was a wonderful captain and we had a fabulous time sailing with him! They did a great job showing us around the BVIs and helping us make memories we will have for a lifetime! Thanks for all your help with the planning, couldn't have asked for a better vacation. We would certainly love to do a trip like this again someday and would recommend it to anyone! Score one for the newbies! To learn more about the crew and Aldebaran's special offer for 2013 charters CLICK HERE. 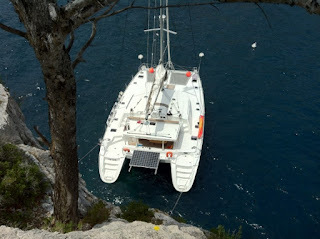 Aldebaran is a 57-foot Lagoon catamaran with a crew of two, Oliver and Naomi. Aldebaran is fully air conditioned and accommodates up to six guests in three cabins, each with Queen-sized berths and ensuite head/shower. They also have a small single berth mid-ship in the port hull passageway (not a separate cabin). Aldebaran has a 14-foot dinghy with 60HP motor, waterskis, kneeboard, tube, wakeboard, wake skate, standup paddleboard, two surfboards, kayak, snorkel gear, hammock, TV/DVD in main salon, 2 portable DVD players, Playstation3 with 5 games, computer on board for checking email, etc. The charter yacht Matau, the beautiful 75-foot Privilege flybridge catamaran, has a last-minute special offer for a yacht charter, sailing vacation in the British Virgin Islands (BVIs). Catamaran Matau is fully air conditioned and has accommodation for eight guests in one king and three queen ensuite cabins. Exceptional is the word for the king-bedded master stateroom with an ensuite bath that's as large as the guest cabins and has the luxury of a full-size Jacuzzi tub... in a catamaran! There are so many choices for lounging on deck... the trampolines, aft deck, bridge deck, the "teak beach", and broad steps aft (very easy for water access!). Everyone will find their own favorite spot. We are getting many requests for last minute and spring break charters. Contact Paradise Connections ASAP so you will not be left out in the cold. We would like to share comments from a lovely Christmas card that Bill & Ann of the charter yacht Corus received this year from past clients. So, Kay and I are sitting here on Christmas morning, remembering last Christmas... We had just decided to try a sailing adventure. We had spent time in the Carribbean in the past, and looked forward a different perspective... and that is where an adventure with Bill & Ann was set in motion! It was great to have such patient people to spend the week with! As we shared with you guys, Kay is not a swimmer, but the floaty worked great, allowing her the chance to see the underwater world. The snorkeling as usual was great! Finally, your boat, Corus, was more then we expected. Our cabin was great, (did we mention the food?) the sailing was fun, and the day you guys arranged for the whale to pop up was something!! Wishing you health, happiness and a very Merry Christmas!! The charter yacht Corus is a 42-foot Whitby ketch, owned and operated by the British couple Bill and Ann Hasted. Corus specializes in all-inclusive, crewed yacht charters for two in the US & British Virgin Islands all year round. 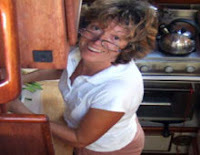 Bill is a Dive Master and Ann is well known for her cooking skills as she has won many awards in culinary contests at the annual BVI charter yacht shows. Corus has a large guest cabin aft with a queen-sized berth and private, ensuite head/shower. Access to the guest cabin is either from the boat's interior or by a separate private entrance via the center cockpit. Amenities include a 13-foot dinghy with 30HP motor, 2 one-person kayaks, snorkel equipment, hammock, beach toys, underwater camera & video, internet access where available, Celeston GPS Sky Scout, etc. Bill is a dive master and one dive/day is included for certified divers. Divers may rent gear or bring their own. Soar over the 310-foot long wreck of the RMS Rhone with Promenade Sail Dive Charters during Wreck Week 2013! Your BVI Wreck Week scuba diving charter will include 7 days and 6 nights aboard Promenade, a fully air conditioned, 65-foot trimaran with a beam of 35 feet... a very stable platform. The charter fee includes all on-board buffet meals, cocktails and hors d'oeuvres, wine with dinner, all diving, and other water sports including fishing, waterskiing, kayaking. The style of diving on Promenade will be casual. If you are a photographer, please feel free to go at your own pace. If you want a divemaster to lead you, follow Promenade's crew member. 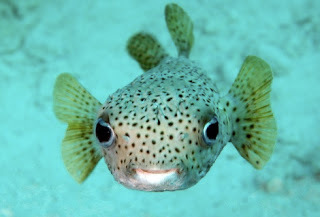 If you prefer diving by yourself, after a thorough briefing on the site, go right ahead. If YOU want to get up very early in the morning and jump in the water (as we tend to anchor over dive sites because of night dives this week) feel free to do so, as long as a crew member knows that you are in the water. 6 nights' accommodation aboard Promenade Liveaboard Sail Diving Charters (Sunday to Saturday). All food and beverages on the yacht, including wine with dinner, cocktail hour (for those not night diving), beer and soda. Unlimited diving featuring the wrecks of the BVI, including a minimum of 3 dives on the wreck of the RMS Rhone (including a night dive). $1750 per person, based on 2 guests per cabin ($3500/cabin, double occupancy). Discounts are available for a group chartering the entire yacht. Two cabins will be available on a "first come/first reserve" basis for single divers. One cabin for guys and one for gals... This is a great opportunity for those divers who can't find a dive buddy to come along with them. This is a sample itinerary ONLY. We have two wrecks on Anegada Reef, the Parametta and the Rocus, that we will dive if the weather conditions allow. We do, however, guarantee to hit as many wrecks as we can in the time as we can and to do unlimited diving. Day One, May 5: Board Promenade 12 noon. Promenade will welcome you with a light lunch before sailing over to the wreck of the FEARLESS outside Great Harbor on Peter Island to do our first wreck dive. We will anchor for the evening at Little Harbor on Peter Island. For those staying overnight on island the evening before (May 4th), we can offer a special rate for a "sleep aboard"
Day Two, May 6: We will dive Carrot Rock on the outside of Peter Island after breakfast, one of our favorite dive sites, with pinnacles reaching from 70 feet up to the surface. Lunch will be at White Bay at Peter Island, with time for a beach excursion or snorkeling trip before we dive “Brown Pants” on the outside of Norman Island, or Santa Monica Rock, so named for the Santa Monica that hit the pinnacles here on April 29th, 1783 and subsequently sank at Water Creek on St John. We will anchor for the night at Privateer Bay on Norman Island. Also known as the Caves at Treasure Point and the setting of Robert Louis Stevenson’s Treasure Island. Day Three, May 7: After a snorkel before breakfast with all the Glassy Eyed Sweepers in the caves, we will take a short hop over to the Indians, so named as they look like an Indian's feathered headdress from a distance, where we will do a dive before sailing up for lunch at Salt Island. After hearing the history of the wreck of the Rhone, we will dive the Rhone in the afternoon and then after dinner, SCUBA to watch the turtles sleeping underneath the wreck and the lobsters and crabs wandering around. This is bar none, not only the Best Wreck dive in the Caribbean, but also in the top 5 dives of the world. We will anchor overnight on Salt Island. Day Four, May 8: Up and in the water early for a dive before breakfast before anyone else has a chance to disturb the wreck, this will cap off our SCUBA diving on the RMS Rhone. We have three additional wrecks on our diving agenda today the Beatta, the Inganess and the Marie L and the Pat. 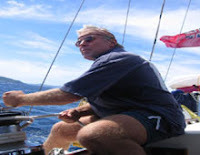 Day Five, May 9: We sail early, weather permitting, out to the wreck of the Chikuzen, our second most famous wreck. We will dive the Chikuzen before lunch and again after lunch before taking a leisurely sunset sail into Muskmelon Bay on Guana Island, one of our favorite deserted anchorages. Or perhaps we will head out to the Rocus and the Parametta? It all depends on the weather! A night dive is planned for those interested. Day Six, May 10: After a breakfast of watching the pelicans circling while they feed on the billions of bait fish in this bay, we will go around to the outside to dive Grand Central Station. Grand Central Station is so named for the many fish that converge around here, and it is capped up by a spectacular large cave that goes through the island at about 60 feet. Perhaps this afternoon will be a good time to visit the Baths? Friday night will find Promenade either anchored at Trellis Bay or Road Harbour and a last night to party under the stars. 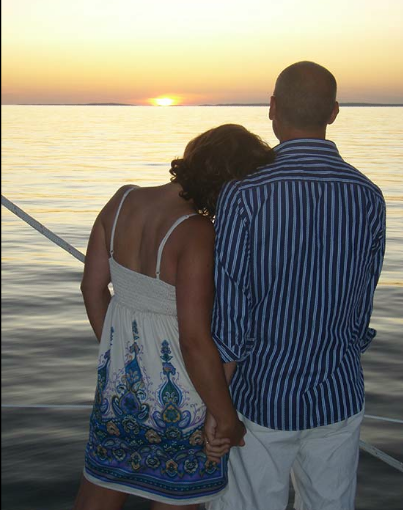 Day Seven, May 11: Sadly, it is time to sail back to marina, and disembark and leave paradise, with great memories.